One day only! Register and receive a FREE Alumapalooza T-shirt! 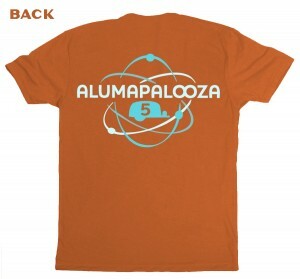 Register for Alumapalooza on April 1, 2014, and get a free T-shirt! If you attended the first Alumapalooza five years ago, you wouldn’t recognize it today. The (almost) all-new program is now packed with new activities (like the Airstream Oscars, the Love Story project, and more), seminars (all new panel discussions and tech talks), and for the first time ever, off-site tours. No foolin’! Many hidden gems and fascinating attractions are within a short distance from the Alumapalooza grounds at Airstream, Inc., and we’ve organized special group tours. Stay tuned to this website, Facebook, and Twitter for details. We’re bringing back your favorite activities, too: daily yoga, the Backup Derby and Rivet Masters competitions, talks and meetups with Airstream Inc. staff and leadership, the Aluminum Gong Show (and new top-notch entertainment), happy hours with doorprizes, unlimited socializing with your Airstream brethren, and twice-daily factory tours, of course. Are you an Airstream newbie? Perfect! Alumapalooza is a great way for new owners to get acquainted with the Airstreamer community, learn tricks and tips, and visit “The Mothership” where your coach was built by hand. Register soon—or on Tuesday, April Fool’s Day, to get that FREE t-shirt!